Everyday we see things we’d rather not see. Reality is harsh sometimes, dude. We’re faced with the harsh facts of everyday life, well, everyday. Turning a blind eye isn’t exactly impossible, but some people have a harder time turning a blind eye than others. If there was a way to see things how you would prefer to see them, would you take that opportunity? The Digital Escape is a mask which draws a shroud between you and the realities you face, projecting serene images in the place of the harsh truth. 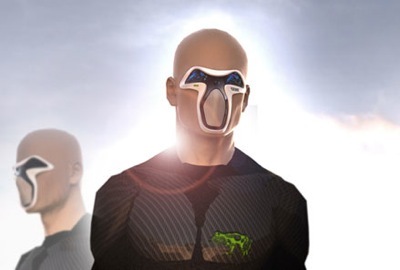 The Digital Escape mask makes the user look like a robotic being, but it’s the story behind the lens that makes this wearable a unique object. With the Digital Escape smells, sounds, and even air quality would be imitated to create a full sensory experience. The user could be staring at a family member lying in a puddle of their own blood, and be non-the-wiser to the harsh reality. Instead, they’d see images of peace and well-being. The mask would also mimic your facial expressions to create an avatar which could visually interact with other users of the device. While The Digital Escape might be an awesome addition to shroud the truths of life, it also gives us a grim look at a future where emotions are desensitized using technology.